Guest blogger Danielle Marie Georgiou is the artistic director and choreographer of DGDG: Danielle Georgiou Dance Group. She also serves as the Assistant Director of the UT Arlington’s Dance Ensemble. And she’s a member of Muscle Nation. A version of this review also ran on glasstire.com. “The Color Black: A Conversation in Three Parts,” features work from three young, local, upcoming artists: Diane Durant, Timothy Harding, and L.E. Doughtie. This weekend is your last chance to see it at weekend at 500X. Each artist made new work under the overarching concept of the color black as a symbol for absence or void. 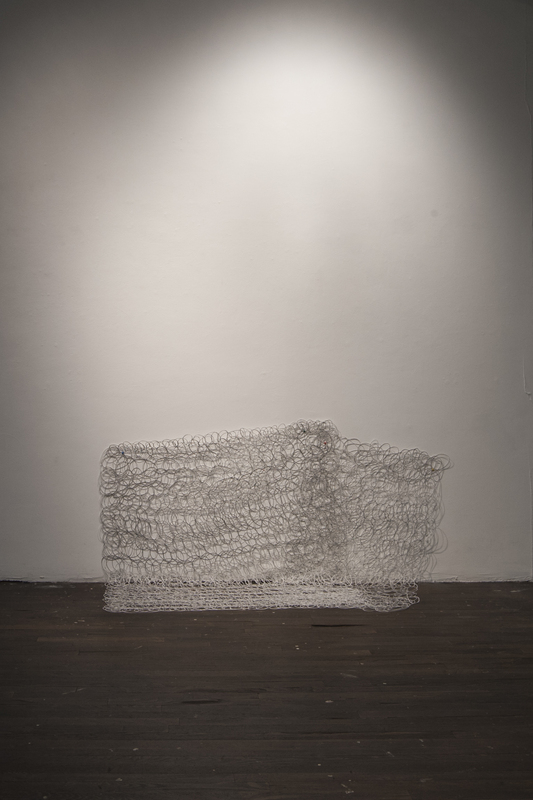 Employing black and white photography (Durant), graphite drawing (Harding) and ink (Doughtie), each uses black as the primal element that obscures, rather than reveals, information. Can a photo tell you the truth? Or is it just a representation of how you want that moment in life to be framed? Durant’s work balances that fine line between reality and fiction, as her documentary style photographs speak to the absence of life — the absence of humanity even. Her textual photographs have an absurdist sense of humor that are typically American, and beautifully so. Phrases at first glance meaningless, e.g. “The air was saccharine like strawberry ice cream and almost as pink,” cause a chuckle when a memory you didn’t even know existed in your life pops up. 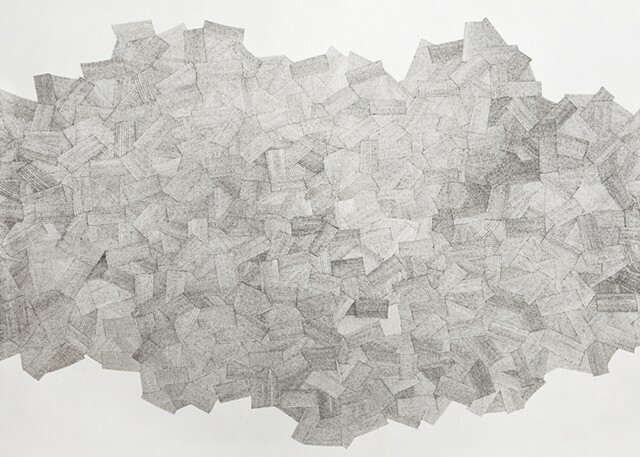 Harding’s graphite drawings overtake the canvas on which they live, consuming its entirety, erasing any doubt of the existence of negative or positive space. These new works stay true to Harding’s past, in which he created pieces that explore the boundaries and limits of drawing. Does it have to stay within the lines? Harding says no. And these graphite pieces agree. Also exhibited are paper constructions that recall previous pieces that respond to the architectural detail of the environment in which they exist. In the upstairs gallery, a floor piece against the back wall brings the black floor up along the sides of the wall and the windows, spreading the shiny quality of the concrete up to our eyes. 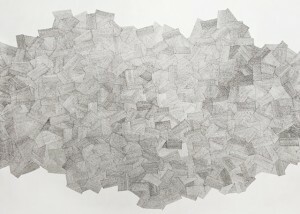 Doughtie’s ink on paper drawings are painstakingly meticulous. Each mark, each line is carefully placed, carefully structured to create a surreal landscape. From a distance, the black appears to have obliterated the paper. Yet, they are so inviting – you can’t help but approach for a closer look. And it’s worth it: once you are eye-to-eye with the drawings, a new world is revealed, one of subtle details that feels like you are looking into Doughtie’s obsessed mind. Exhibiting artists will be at the gallery to great visitors on Saturday and Sunday. The gallery will also be open until 8 p.m. on Saturday for East Dallas Gallery Day. 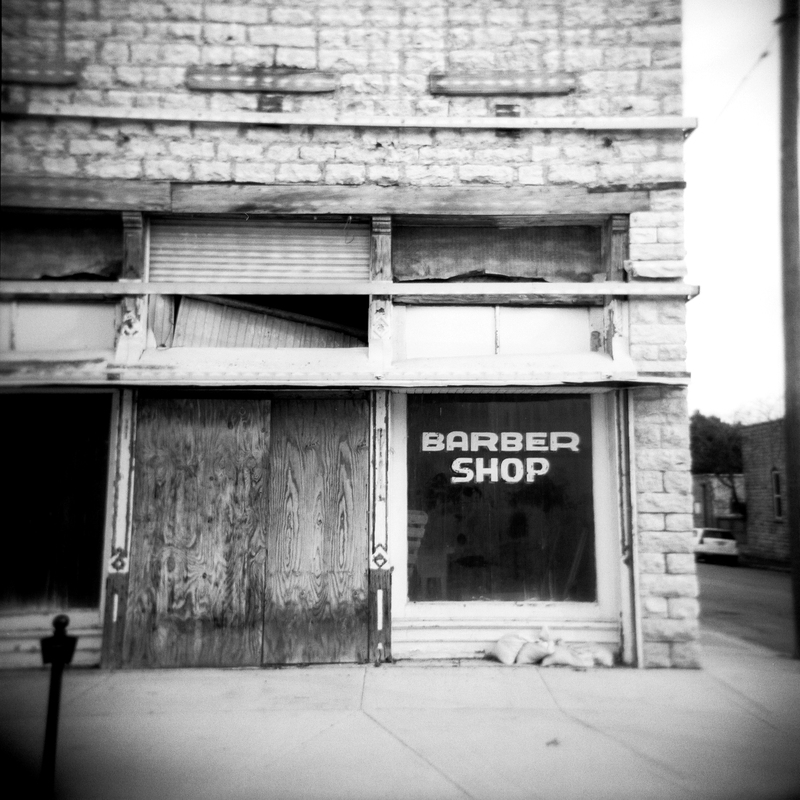 the barber shop photo would have been better without the late model sedan on the right!